What are you really agreeing to when you click that fateful “agree” button? Terms & Conditions cuts out the legal lingo to spell it out in plain English. There are certain data that will always be public. This includes your name, your hometown (i.e. “location” in your profile), your bio, your profile picture and other public photos, your likes, your tips, your lists, and your friends. The only way to hide this info is to either not include it, or to change it so it doesn’t actually reveal any personal information about you. If you don’t, this information can easily be found through a simple Google search for your name, or other online outlets. Of course, if you want to become “mayor” of a certain location, that’s public too – that’s just part of the feature. Personal data: The first section, “What Personal Information Does Foursquare Collect?,” tells you exactly what you think it does. And it basically says what most social networks say these days: Your “Personal Information” – email address, phone number, birthday, social media handles, which websites you visit, and information related to your Foursquare usage – are all collected by the company. Foursquare does not try to hide the fact that this info will be used to serve you targeted advertising, as well as other service-related features. Impersonal data: Also like most other social networks, Foursquare distinguishes between “personal” and “non-personal” information. The latter category includes things like IP address, cookie data, your browser info, which device you’re using, etc. Foursquare aggregates your data and that of other users, and will share this information with its partners. Third parties: Foursquare has added an entirely new part to the data-collection section that deals with third parties: Namely, Foursquare will collect your data from other companies that are linked to your Foursquare account in some way. The company gives the example of redeeming a Foursquare deal in a credit card purchase, in which case Foursquare will learn when and where you made that purchase. Again, pretty standard stuff – problematic stuff, if your’e particularly privacy-conscious, but standard all the same. Friends: Your Foursquare friends can see, “the location and time of each of your check-ins, name, email, phone number, photo, hometown, mayorships and badges, links to your Twitter and Facebook accounts (if you have connected those accounts to your Foursquare account), a list of your friends, and tips you write,” the company explains. Those so-called “friends” can then share that data with whomever they like, so be careful who your friends are. Businesses: Of course, of the main reasons people use Foursquare is to check in at businesses. Doing so allows these businesses to see who’s checked in (unless you turn off that option in your privacy settings). As mentioned, if you want to become “mayor” of a certain location, that will, of course, be made public. Foursquare API: There are thousands of third-party apps that use Foursquare’s API, which gives those apps the ability to access much of your information. And because this information can be accessed through any of your Foursquare “friends,” the only way to avoid having your data spread around to countless other apps and app developers is to tweak your profile so it doesn’t include any accurate information about you. But the consequences of all this aren’t just that people will be able to easily find out where you shop, eat, drink, and socialize. Using Foursquare also means that your location information can be easily shared with law enforcement – something the EFF found the company more than willing to do. Likely of greater concern for the average person is that Foursquare data can be used for “credit risk reduction.” That’s right, your Foursquare check-ins could help determine whether you get that loan, credit card, or mortgage. This, combined with everything else, makes me, for one, never want to use Foursquare. Ok, so by now you’ve probably figured out that using Foursquare is a great way to tell the world a whole hell of a lot about yourself. So if privacy is something you even remotely care about, I highly recommend not using it at all. But if you do want to have a Foursquare account, here’s how to make it private as possible. 1. Use a fake name: As mentioned, your full name will now appear next to all your check-ins. There’s no way to turn this off. But you can use a fake name by changing it in the “Your Profile” part of your settings. 3. Don’t link your Facebook and Twitter profiles: Foursquare makes it east to share your information on Twitter and Facebook. But this only increases the amount of data about your life that is out in the open. So, as tempting as it may be, you shouldn’t link these accounts together. 4. Don’t connect any apps: While connecting apps may make Foursquare more useful and fun, it also decreases your privacy further. Don’t connect any of them. 5. 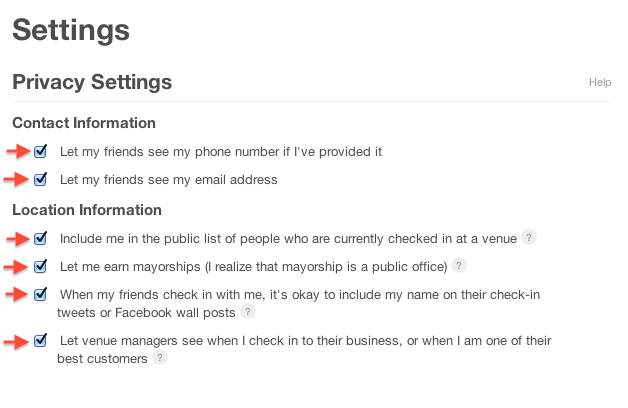 Uncheck all of these boxes: You can find this under “Privacy Settings” under “Settings” when you’re logged into Foursquare. As you have probably realized, one all this is done, there’s not really any point in using Foursquare. Which should tell you something: If you can’t use the service without divulging massive amounts of information about yourself to the world, should you really be using it at all? It’s ok if your answer is yes, of course. But just know what your’e getting yourself into.